I haven’t been a very active knitter of late. I worked on this on Thanksgiving, when I figured out how to increase after knitting the fourth row, and then I did nothing until around Christmas time when I started up again. 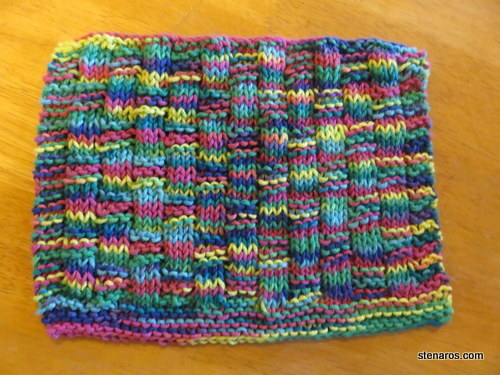 I finished this dishcloth and laughed when I set it out to photograph it. I forgot to do the end border, which in this picture is missing from the top of the dishcloth. And that’s what I like about knitting dishcloths. It’s a very low bar. If I give this to someone who likes knit dishcloths, they will be thrilled and not spend much time analyzing the flaws. The dishcloths in the book I am working out of are winder than I would prefer. At their current width I should use more than one skein to make them square. But that would be a huge dishcloth, so they end up rectangular instead of square. Perhaps after I finish knitting all of them I will see if I can figure out how to make them not as wide, without destroying the pattern. Previous Previous post: Baby Blanket Finished! Next Next post: How’s that bullet journal thing going?